Binary star systems are very common, which is one of the reasons why there have been suspicions that out there, somewhere, there may lurk an unseen companion to the Sun, yet to be directly detected. The name Nemesis has been attached to this hypothetical body - the dark nature of the name chosen to reflect a popular theory in the 1980s that Nemesis periodically sent comet swarms our way from its distant abode in the outer Oort cloud. Nemesis (likely a sub-brown dwarf of several Jupiter masses) has not yet been discovered, despite sky searches using infra-red telescopes like IRAS and, more recently, WISE. Still, absence of evidence is not entirely evidence of absence, although the more these searches flag up 'nothing to see here', the more likely that the Sun really is a solo stellar object. However, it's becoming clear that stars like the Sun do actually form with companion objects (1). Stars are born inside egg-shaped cocoons called 'dense cores'. These Cosmic Eggs are found within stellar nurseries - immense clouds of cold, molecular hydrogen which are often dark and opaque to visual telescopes. Astronomers have to use radio telescopes to study their contents. These observational studies show that the younger the stars within these nebulae, the more likely they are to be binary stellar objects. This has been predicted by some theoretical simulations showing that stars like the Sun tend to form as binary pairs (2). Perhaps a third possibility should be added: That some stars retain these wide binary objects over the long-term, at varying distances. 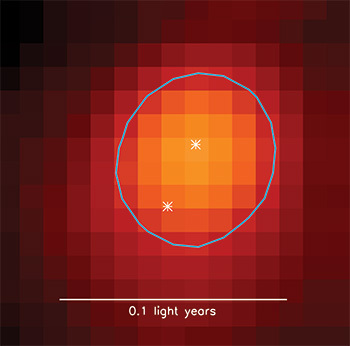 In the case of formation of brown dwarf companions, then theoretical work has shown that these can quite readily be transported into highly eccentric orbits around the parent star, as well as facing possible ejection from the young system (4). According to this new thinking, Nemesis might have formed about 500AU away from the Sun, before being ejected from the solar system in the early chaos. That kind of distance is in the same ballpark as the proposed 'gas dwarf' Planet Nine (5), although at only ~10 Earth masses, this object could hardly be classified as a stellar companion. One would need to pitch the companion object up about a thousand times to a multi-Jupiter mass sub-brown dwarf, at the very least. 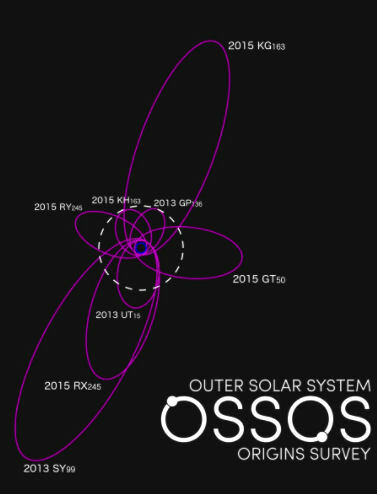 But the Planet Nine proposal is at least consistent with this idea of a wide orbit companion, and P9 creates a whole raft of headaches for astrophysicists regarding its origins. The idea that stars begin life with a wide binary companion as a matter of course opens up some possibilities about the nature of the interstellar realm beyond the heliopause. It can't have been just empty space, set well beyond the Sun's protoplanetary disk/accretion cloud. Perhaps Planet Nine started life as a world orbiting that early companion, and became separated from it during the companion's eventual ejection? Or perhaps this companion is still out there, and the effect created by the proposed Planet Nine is a misinterpretation of the perturbing influence of a larger, more distant object. Essentially, that of the Sun's sub-brown dwarf companion. The case for Planet Nine was made last year by Drs Mike Brown and Konstantin Batygin of Caltech. They studied a cluster of extended Scattered Disk Objects (SDOs) beyond the Kuiper Belt, whose orbital properties showed significant common ground. They noted that these distant objects showed profoundly similar arguments of perihelion (1). This was no coincidence, argued the Caltech astrophysicists, and they concluded that a substantial planet lay undetected beyond these worlds, shepherding them into their peculiar orbits. The hypothesis that a sizeable Planet X body lies out there is hardly new, but is usually considered a toxic subject by most astronomers, who, on the whole, have been sceptical that such a body could have formed in the first place and, if it had, remain undetected for so long. Suddenly, an eminent planet hunter had claimed he had found theoretical proof for the existence of Planet X. To detoxify the subject, and make his theoretical discovery more palatable for a sceptical scientific community, he rebranded the object as Planet Nine. The story took off. There followed a great many academic papers from various research groups, keen to understand the nature of Planet Nine - as well as hoping to pin it down and observe it directly. 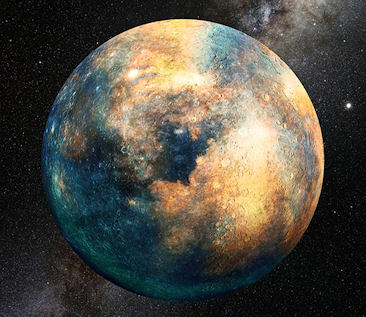 I have described a great many of these published articles over the course of the last 18 months or so on this blog, some of which have shored up the case for an unseen Planet X body lying somewhere out towards the inner Oort Cloud. The crux of the argument for Planet Nine hinges upon the validity of the cluttering effect of these particular extreme trans-Neptunian objects (ETNOs - an equivalent term for the extended SDOs), and whether their common properties might be shared with new scattered disk objects as they are discovered. The existence of a substantial Planet X body would explain a great many anomalies within the solar system, but those anomalies can often also be explained by other phenomena, too. So, the fact that there anomalies does not prove the existence of Planet X, but simply provides a reason to consider the perturbing planet's presence as a common factor. The Caltech team's Planet Nine paper showed that a statistical analysis of the orbital properties of the clustering of extended SDOs put the possibility of a coincidence well beyond reach. However, the cluster represented quite a small sample of the tiny icy worlds beyond Neptune (even if their collective properties were already very unusual). As such, more data is needed, in the form of further future discoveries of similar objects. The discovery of other, similar extended objects showing no common ground with the cluster would weaken the statistical case for there being a clear effect at work. So, the OSSOS team argue that their new data set of ETNOs shows a random distribution, seemingly unaffected by any outside influence by a Planet X body. They then argue that observational bias is indeed a stumbling block for Planet Nine advocates, despite the varied provenance of the original cluster's discoveries. The key object for their argument is 2015 GT50. This new work may bolster the case for Planet X if it, too, isn't attributable to observational bias, as the researcher argue. 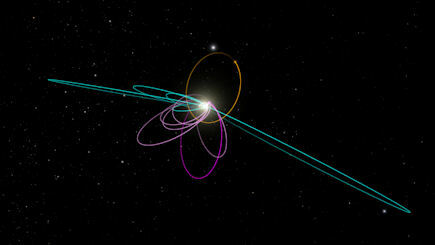 It seems likely that we're about to see a new rash of Planet X science papers appear as this debate heats up. Let us take a ringside seat and watch as things kick off! Scientists at the University of Arizona have made a discovery about the outer reaches of the Kuiper Belt, an extensive asteroid belt beyond Neptune. Objects that populate the main body of this belt have orbital tilt inclinations to the ecliptic (the main plane of the planets) which pretty much average themselves out. Several studies have been carried out to measure the mean plane of the Kuiper Belt (centred around 40AU), which have generally arrived at this same uneventful conclusion. However, since these previous studies were conducted, there have been a rash of discoveries of new Kuiper Belt Objects beyond the Kuiper Cliff - where the belt becomes truncated around 55 astronomical units (AU). This new work seeks to determine whether these new, more distant objects fall into line with the bulk of the Kuiper Belt, or whether there is a deviation from that established norm. The more distant objects in the belt (the extended KBOs beyond the 'Kuiper Cliff', also known as extended scattered disk objects) show a deviated value for their averaged spin axes, creating a mean plane for the extended disk pitched at about 9 degrees to the ecliptic (1). This is an unexpected finding, and too great a value to be attributable to a statistical blip. The authors of the new paper argue that this unexpected distribution has important implications for the dynamical history of the outer solar system. The anomaly calls for the presence of a perturbing body to explain this significant deviation from the ecliptic of these extended KBOs. "If one were to think of the average orbital plane of objects in the outer solar system as a sheet, it should be quite flat past 50 AU, according to Volk. "But going further out from 50 to 80 AU, we found that the average plane actually warps away from the invariable plane," she explains. "There is a range of uncertainties for the measured warp, but there is not more than 1 or 2 percent chance that this warp is merely a statistical fluke of the limited observational sample of KBOs." "The observed distant KBOs are concentrated in a ring about 30 AU wide and would feel the gravity of such a planetary mass object over time," Volk said, "so hypothesizing one planetary mass to cause the observed warp is not unreasonable across that distance."" (2). They don't think this warping of the outer solar system beyond the Kuiper Cliff is likely to be due to Planet Nine. Instead, they favour a solution involving a smaller, terrestrial Planet X body located less than 100AU away. Or maybe more than one Planet X. Or a relatively recent close brush with a passing star which set off all the extended KBOs into a collective series of disturbed spins, which they're slowly all adjusting back from. There are so many possible scenarios on the table now, each grappling with a set of complex constraints from the amassing data from the outer solar system, as well as increasingly accurate astrometry of the planets (which should themselves show finely tuned perturbation by a distant unseen planet). Another alternative, which has not been discussed in the press release (2), or in the scientific paper, as far as I can see (1), is that a more substantial Planet X body has a highly eccentric orbit which periodically brings it within range of the Kuiper Belt. Let's say, for instance, that Planet X spends the vast majority of its long orbit in the vicinity of the inner Oort Cloud, but approaches the outer Kuiper Belt by achieving perihelion at, say, 80AU. That would explain, quite neatly really, why there is such a significant gap in bodies between the Kuiper Cliff (~55AU) and the inner Oort Cloud (~2000AU). This area is swept out by the highly eccentric orbit of Planet X, creating the anomalies in the extended scattered disk, as well as accounting for the lack of observed sighting of the object (assuming, reasonably, that it is currently near aphelion). Astronomers studying proto-planetary disks encircling young stars have been lucky enough on occasion to spot the tell-tale trails of young planets accreting within. These early planets in fledgling star systems can show how quickly the rotating building materials around young stars can form planetessimals. It's not unreasonable to assume, therefore, that our own gas giant planets, Jupiter and Saturn, formed early on too, re-shaping the proto-planetary disk as they absorbed more and more materials, and migrated across large swathes of the early solar system. Studies of the isotopic ratios of materials in meteorites has helped astronomers to build a theoretical picture of the early solar system - a system divided in two by Jupiter. The conclusion they have now drawn from their deductive reasoning is that Jupiter was the earliest of the Sun's family of planets to form, just 1 million years after our star herself (1). By comparison, the Earth is thought to have formed about 50 million years later. Although this may look like an interesting piece of evidence for early cosmic catastrophe, the study involving Jupiter's moons was essentially calculations to rule out whether they would have been unduly affected by such an early encounter. The study concluded that the current orbits of Jupiter's moons could be consistent with such an early event, but not so much with Saturn's (3). That's not to say that this is what happened with Jupiter, only that it could be ruled out in the case of Saturn. 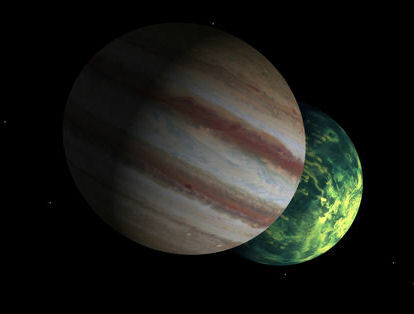 Anyhow, it's interesting that Jupiter seems to have emerged so early on in the Sun's past, when considered alongside the likelihood that the Sun started out with a wide binary companion? It has been suggested to me that perhaps Jupiter was originally a sub-stellar companion, eventually driven into its current, tighter orbit. This might be in keeping with one of the modes of disappearance of an early binary companion, as suggested by Sarah Sadavoy & Steven Stahler, the astronomers from Berkeley who have firmed up the binary universality hypothesis with some direct observations (4,5). More likely, though, is that Jupiter did indeed form within the Sun's own proto-planetary disk, but this took place alongside a quite separate formation of a sub-stellar companion with the Sun within the Cosmic Egg dense core. "Researchers thought remains including scattered deposits of ash, clumps of soil that had been heated to high temperatures, and the remains of large animals, had been left by pre-historic cave dwellers up to 400,000 years ago. A 2010 study into the traces caused controversy in the archaeology world as it questioned the theory of Homo sapiens originating in Africa, but the archaeologists were unable to draw a concrete conclusion from the evidence." (5). 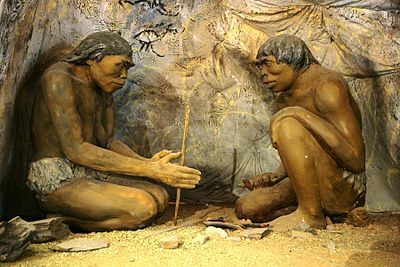 So, the controlled use of fire was well established among hominins long before modern humans emerged, even if that timeline is shifting backwards to several hundred thousand years. These erratic, gradualist developments among proto-humans offer challenges to Sitchin's ideas (9) for a rapid emergence of a technologically more capable human species through genetic engineering intervention. The breeding ground for modernity seems to be widespread, both geographically and temporally. The changing chronology of early humans emerging about 300,000 years ago helps Sitchin's case. The variation in development among divergent pockets of human populations is less easy to explain within his theory. But, then science is having its own headache over this, too. Image Credit: National Museum of Mongolian History in Ulaanbaatar, Mongolia. 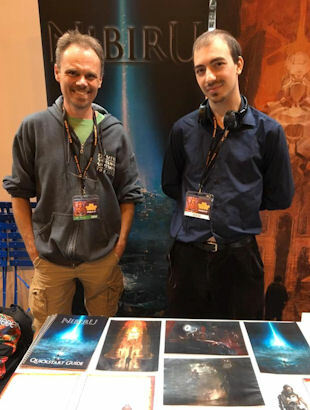 I had the pleasure of meeting Fredrico Sohns over the weekend, who was publicising his new role-playing game 'Nibiru' at the U.K. Games Expo at Birmingham's NEC. The science fiction game involves the recollection of lost memories, and features some superb artwork (1). Besides the mention of 'Enki's Covenant' in the game, 'Nibiru the RPG' is not a Sitchinite construct, according to Fredrico. Instead, Nibiru in this game alludes to a visiting realm, more akin to an enormous alien spaceship. Players in the game awake within this exotic sci-fi realm, and must navigate it in the hope of retrieving their lost memories. In so doing, they build up their abilities and prowess as characters, more capable of dealing with the challenges the various habitats within Nibiru have to offer. The game is still in its development stages, with the hope of obtaining funding through gamer crowd-sourcing, via Kickstarter, later this year. The stall Fredrico ran at the Expo aimed to raise the profile of the game, and give punters the chance to quickly sample its game-play. Best of luck to him and the rest of the Nibiru team as they progress with this exciting project!